Gull demands that Rian spar with him to prepare for the pack’s dominance battles, but Rian recognizes that this is just a self-justification for Gull to savagely abuse him. Rian creates an imaginary alter-ego, Tark, as a friend, but Tark advises him to give up all feelings and to create an emotional wall against the world; to resign himself to a life of pain and loneliness, except for protecting his younger brother Rutlin from their father. When all of Lissa’s peers among her pack’s adolescent females are wrapped up in discussing and choosing their future mates, she is cornered by Si’tung, an arrogant wolf who already considers himself their pack’s future alpha male. Si’tung tells Lissa that he will have her whether she wants him or not. The other adolescent female wolves offer Lissa no sympathy; they tell her that she should be glad such a strong and handsome wolf has shown an interest in her. Lissa takes up self-mutilation in her despair. Both Rian and Lissa fall into the habit of leaving their packs unnoticed, and sneaking far off to howl at the moon alone in misery. One day they hear each other, and are drawn together. Each is amazed to find another wolf of a similar nature, and in his/her own circumstance. Gradually, they fall into companionship and then love. But what are they to do next? Rian would never be accepted by Lissa’s pack or parents. Lissa would probably be raped by Rian’s father if she left her pack for his, aside from the fact that Si’tung would never let her go. Tark urges Rian to not get involved with Lissa since it can only result in further emotional and physical misery and torment for him. Tark smirked in his head, Do you honestly think she would want to have that kind of relationship with you anyway? What? Do you think she loves you? Don’t get your hopes up, fool. Their mutual love builds up their self-reliance to the point that Rian and Rutlin come to live with Lissa’s pack, and Lissa tells Si’tund openly to get lost. The two nervously expect that their actions will have consequences, but they are determined to meet them. 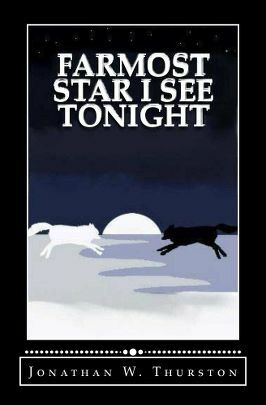 Farmost Star I See Tonight is probably not a novel that Flayrah’s readers will enjoy. Furry fans know a bit about real wolf pack behavior, and the behavior in this novel – the wolves having separate dens and families, and a pack school for the cubs – is too much of comic-book funny animals and toddlers’ picture books. Thurston says, and I agree, that this is a parable. The intended readership is the emotionally lonely adolescent who has serious problems, real or imagined, and no friends to discuss them with. If you know of anyone like this, get him or her this book. The cover illustration is by Theresa Digiacomo.